Zion Market Research has published a new report titled “Bioplastics & Biopolymers Market by Material Type(Regenerated Cellulose, Bio-polyethylene (Bio-PE), Starch Blends, Bio-Polyethylene Terephthalate (Bio-PET), Biodegradable Polyester, Polyhydroxyalkanoates (PHA), and Polylactic Acid (PLA)) and by Application (Agriculture, Consumer Products, Packaging, Automotive, Bottles, and Others): Global Industry Perspective, Comprehensive Analysis, and Forecast, 2017–2024”. 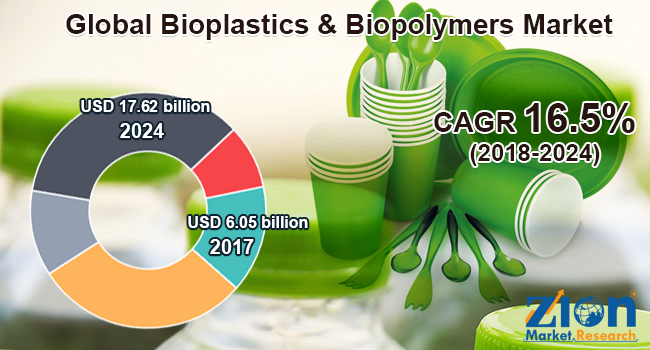 According to the report, the global bioplastics & biopolymers market was valued at approximately USD 6.05 billion in 2017 and is expected to generate revenue of around USD 17.62billion by the end of 2024, growing at a CAGR of around 16.5% between 2018 and 2024. The extensive use of bioplastics and biopolymers as consumer products is likely to drive the global bioplastics &biopolymers market growth in the forecast timeframe. Plastic has become an essential part of our day-to-day lives. Large amounts of plastic wastes are generated across the world, which mostly comes from household and industries, such as packaging, electronics, automobile, construction, and agriculture. Various organizations, such as the packaging and Packaging Waste Directive, Waste Framework Directive, and the European Environment Agency, have taken the initiatives to recycle plastic and recover energy. These factors are expected to increase the demand for bioplastics and biopolymers that are biodegradable and environment-friendly in nature. The concept of smart buildings, smart cities, and connected cities are expected to positively impact the bioplastics & biopolymers market in the upcoming years. Owing to the concept of smart buildings and smart cities, there is a huge demand for bioplastics and biopolymers across water and waste management sectors as well as renewable energy management sector. Furthermore, raising awareness among consumers regarding plastic waste management along with strict laws governing plastic waste management across the world has also increased the demand for bioplastics and biopolymers globally. However, the high prices of bioplastics might restrain the bioplastics & biopolymers market growth in the upcoming years. By material type, the bioplastics & biopolymers market is fragmented into regenerated cellulose, bio-polyethylene (Bio-PE), starch blends, bio-polyethylene terephthalate (Bio-PET), biodegradable polyester, polyhydroxyalkanoates (PHA), and Polylactic Acid (PLA). Bio-PET accounted for the highest revenue share in 2017, due to the growing demand from various end-use industries, such as packaging and bottling. Moreover, the rising consumption of beverages among people is also expected to further drive the growth of this segment in the upcoming years. By application, the bioplastics & biopolymers market is segmented into agriculture, consumer products, packaging, automotive, bottles, and others. Packaging segment accounted for the highest revenue share in 2017, due to the increasing demand for sustainable solutions from various industry verticals, such as food and beverages, automotive, etc. Moreover, the enhanced industrial and manufacturing technologies have enabled the food and beverage industries to integrate bioplastics in packaging. These factors are expected to further drive the growth of the packaging segment in the upcoming years. North America, Latin America, Europe, Asia Pacific, and the Middle East and Africa are the regional segments of the global bioplastics & biopolymers market. Europe accounted for the highest revenue share in 2017. The growth can be attributed to the increasing demand for bioplastics and biopolymers in the region. Moreover, the vast distribution network for bioplastics and biopolymers in the region is expected to positively impact the industry growth in Europe. The U.S. is one of the major revenue generating countries in North America for bioplastics and biopolymer. Enforcement of stringent government regulations for plastic waste management is expected to drive the industry growth in North America in the forecast time period. Some key players operating in the bioplastics&biopolymers market includeCorbion NV, Arkema, BASF SE, KURARAY, Eastman Chemical Company, Novamont, NatureWorks LLC, Celanese Corporation, Metabolix Holdings, and Braskem S.A., among others.